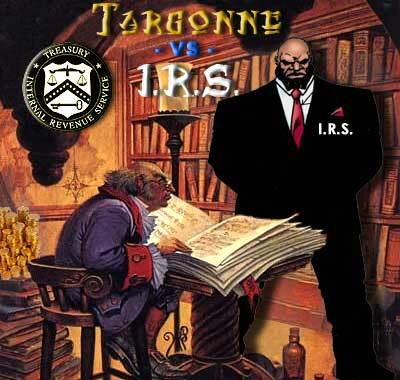 Targonne Morghan VS The I.R.S. This Rumble ended on 2003-05-01 00:00:00.0. Likability: Gives an ominous feeling when he is discussed. Popularity: Strikes fear in the heart of taxpaying citizens. How He Works: Takes about 42.3% of the average family's income, plus the eldest male son for slavery in Neraka. Dealing With Him: 80% of taxpayers must hire professional adventurers to get rid of him or them may disappear and never return. The Cost: Nearly 300,000 peasants are cut down yearly to produce the fear and anxiety necessary for totalitarian control. Likability: Gives an ominous feeling when they are discussed. How They Work: They take about 38.2% of the average family's income; that's more than for food, clothing and shelter combined. Dealing With Them: 60% of taxpayers must hire a professional accountant to get through their own tax return. The Cost: Nearly 300,000 trees are cut down yearly to produce the paper for all the IRS forms and instructions. Employees: 114,000 employees on the payroll. Morham Targonne was having a bad day. His accounts would not balance. The difference in totals was paltry, a matter of a few steel. He could have made it up with spare change from his purse. But Targonne liked things to be neat, orderly. His rows of figures should add up. There should be no discrepancies. Yet here he was. He had the various accounts of moneys coming into the knights’ coffers, and there was a difference of twenty-seven steel, fourteen silver, and five copper. Had it been a major sum, he might have suspected embezzlement. As it was, he was certain that some minor functionary had made a simple miscalculation. Targonne would have to go back through all the accounts, redo the calculations, track down the error. An uninformed observer, seeing Morham Targonne seated at his desk, his fingers black with ink, his head bent over his accounts, would have said that he was looking on a loyal and dedicated clerk. The uninformed observer would have been wrong. Morham Targonne was the leader of the Dark Knights of Neraka and thereby, since the Dark Knights were in control of several major nations of the continent of Ansalon, Morham Targonne held the power of life and death over millions of people. An aide staying to work late into the night rushed into the room highly alarmed. "My lord, an agent of the IRS has arrived from-"
"What are THEY doing here at this time of night?" Targonne asked annoyed. A tall, dark and sinister man wearing a dark black suit and carrying an expensive briefcase strolled into the cluttered office. "Mr. Targonne?" "Lord Targonne, and what are you doing here?" Targonne asked looking up from his work. "Mr. Targonne I am here to inform you that you have been selected for a corporate audit. We have detected some discrepancies in your accounting over the past couple years and I am here to investigate them," said the man in black setting down his briefcase and removing a calculator. "This is preposterous! I’ll have you thrown in the dungeons for this intrusion! Guards!" shouted an infuriated Targonne. "I think not," muttered the man as he pushed the aide out the door and barred it from the inside. "It will just be you and me Mr. Targonne. Now let’s review these figures shall we? I see you’re off by twenty-seven steel, fourteen silver, and five copper."